It’s getting down to the wire and the Georgia Force need wins not just to stay in the American Conference South Division race but also to simply earn a playoff spot. 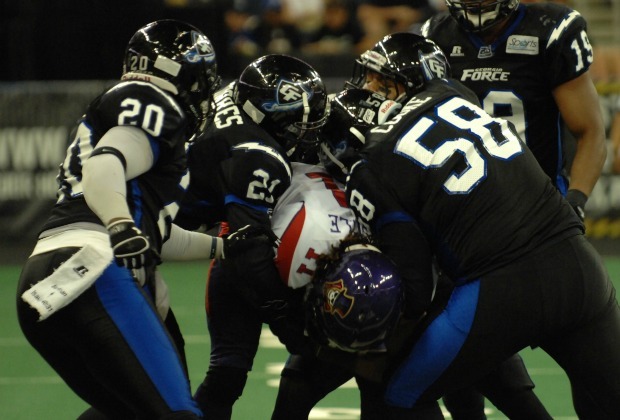 Sunday saw the Force stay alive in the playoff chase as they pulled out a narrow victory against the Orlando Predators 56-53 at Gwinnett Arena. The Force (8-8) jumped out to a 14-3 lead in the first quarter thanks to quarterback Bryant Moniz who threw a 28-yard touchdown pass to C.J. Johnson to start the game, followed by a 12-yard touchdown pass to Larry Shipp towards the end of the quarter. Orlando (2-13) got its first touchdown of the game early in the second quarter when Chris Leak threw a 7-yard touchdown pass to Jarvi Williams. The Force responded by scoring on the ensuing drive as Moniz threw a 9-yard touchdown pass to Shay Hodge to keep the lead at 11. Leak threw his second touchdown pass of the game on the next drive when he found T.T Toliver on 18-yard strike. The Force answered the Predators when Benji McDowell scored on a 1-yard touchdown run, but Orlando would end the half with a score as Leak found Glen Fox for a 13-yard pass. The Force would make their move in the third quarter when Moniz threw two crucial touchdown passes. His first came at the start of the half when he found Hodge for a 3-yard strike. His second came towards the end of the period when he found Mike Johnson for a 3-yard pass. Orlando’s lone score of the third quarter came directly in between the two Force touchdowns. The Predators would cut into the lead early in the fourth when former Force fullback Mykel Benson rushed for a 1-yard touchdown. A two-point conversion cut the Force lead to four. The Force answered on the next play from scrimmage as Moniz threw a 34-yard touchdown pass to Hodge to put the Force back ahead by 11. Leak and Moniz traded touchdowns as the Force held a 10-point lead with less than a minute to play. Orlando cut the lead to three on a Benson 1-yard touchdown run. The Predators then had a chance to tie the game after the Force turned the ball over on downs, but Caleb Bostic blocked a field goal attempt from Mark Louis, allowing the Force to sneak away with a huge win. Moniz was named the Russell Athletic Offensive MVP after passing for 273 yards on 21-of-29 passing with seven touchdowns. Through his first two Arena Football games, he and has thrown 10 touchdowns and zero interceptions. Shay Hodge was named Playmaker of the Game for catching 10 passes for 144 yards and four touchdowns. Robert Durham was named Riddell Defensive MVP for tallying seven tackles. With the win, the Force are in good position to clinch a wild card spot. They still have a good chance to win the division with the win moving them to just one-half of one game behind New Orleans, who the Force face on July 21. The Force are off next week and will be back in action July 14, when the Pittsburgh Power travels to Gwinnett Arena for the final home game of the regular season.